LOUDON, TN--(Marketwired - September 22, 2016) - Malibu Boats, the global leader in watersports towboat sales, has introduced the 2017 version of its ultra-premium M235. The M235 debuted in 2016 and has since become the go-to Malibu model for customers who accept nothing less than the absolute best and undisputed state of the art in performance, style and luxury. Already the pinnacle of watersports boats, the Malibu M235 offers customers even more of a good thing for 2017. With seating for up to 17 and the deepest storage in the Malibu line, the especially spacious M235 has room for the whole family. Its exceptional performance, impeccable craftsmanship and attention to detail are second to none. The M235 exclusively features Malibu's deepest hull and most luxurious cabin. Equipped with Malibu's most powerful Monsoon engine, largest ballast capacity and full array of Integrated Surf Platform (ISP) technologies, the M235 makes the largest wake and waves of any Malibu ever. 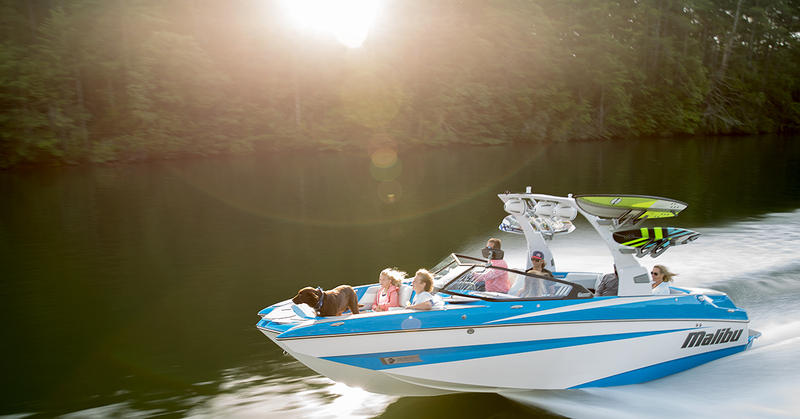 As in every Malibu, wakes and waves are easily customized to suit all ages and skill levels. The M235 handles with superb agility on the water for unmatched towboat performance. It's those superstar qualities that appeal to discerning customers, including country hit music singer-songwriter, Jake Owen. "Being out on the water on my boat is my absolute favorite place to be. Malibu's M235 is an amazing machine and makes my time on the water even more special," said Owen, whose hits include 'Barefoot Blue Jean Night' and 'American Country Love Song.' "Not only is the M235 awesome for wake boarding and wake surfing, but it's perfect for hanging out with a group of your friends and family and just enjoying life. The M235 I have now is really special, because my daughter Pearl chose the color, pink diamond metallic." For 2017, the M235 debuts an all-new onboard entertainment system by Wet Sounds™. New amps deliver higher power, and digital sound processing is custom-programmed for the M235 to ensure consistent sound setting and quality. The speakers, including a 12-inch subwoofer, match the tower speaker design. A new stereo puts control in the Command Center's standard 7-inch screen, to the right of the main 12-inch screen. The system adds multi-zone volume control (interior front/rear and tower), plus a new transom remote. Signaling for the Surf Gate™, the patented Malibu system that turns the wake into a big surf wave, now goes through the tower speakers, rather than a separate buzzer, when a side-to-side transition is about to occur. For a luxurious feel in the M235, SeaDek track material is also used for the Soft Grip flooring, swimboard and transom pads. The M235 comes standard with Malibu's best tower, the G4, which gets even better for 2017 with side pull points for surfing and upgraded LEDs for cockpit, anchor and rear-facing lighting. Topping off upgrades for 2017, the M235's vast customization palette is further expanded with new gel and flake colors.